The Census of SA Plants, Algae and Fungi provides a summation of the current state of scientific knowledge of the flora of South Australia, as reviewed by the taxonomic botanists and research associates of the State Herbarium of South Australia. It covers all major flora groups for which the State Herbarium is responsible: the vascular plants (flowering plants, conifers and ferns), bryophytes (mosses, liverworts, hornworts), macro-fungi, algae and lichens. 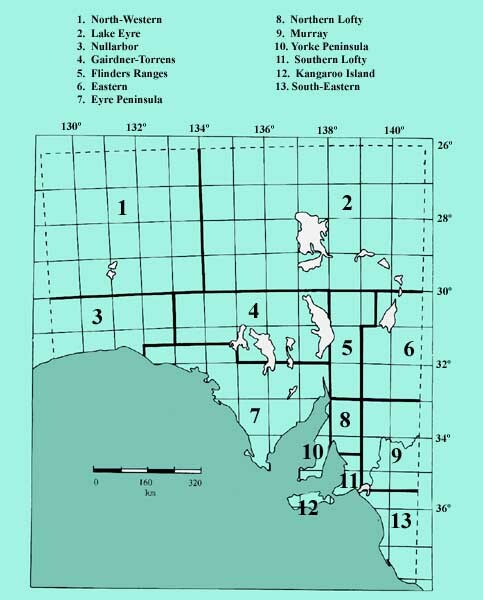 The census forms the backbone of the Electronic Flora of South Australia. From the various outputs you can access the fact sheets that are available (shown by hyperlink) of species, genera and families. The Census lists current scientific names of plants with their regional distribution within South Australia. Important former names (synonyms) are provided with each current name. Searches can be performed on current or former names. Suffix and prefix codes provide further information, e.g. on the native or naturalised status, conservation rating and declared status for invasive species. The census is updated as name changes occur and the data accessible to the public via the eFlora pages is refreshed nightly. This up-to-date view, covering all major groups, is available via the Census query form below. The last printed Census of South Australian Vascular Plants (Edition 5.00), published on 18 March 2005, is available for download in pdf form, but it is long out-of-date.